On 16th Rajab 1439, Sunday, Aqaa Maulaa attented two functions one in morning in Jannat ul-Mumineen (Qabarastaan) and the other after the Maghrib Namaaz in Nooraani Masjid. 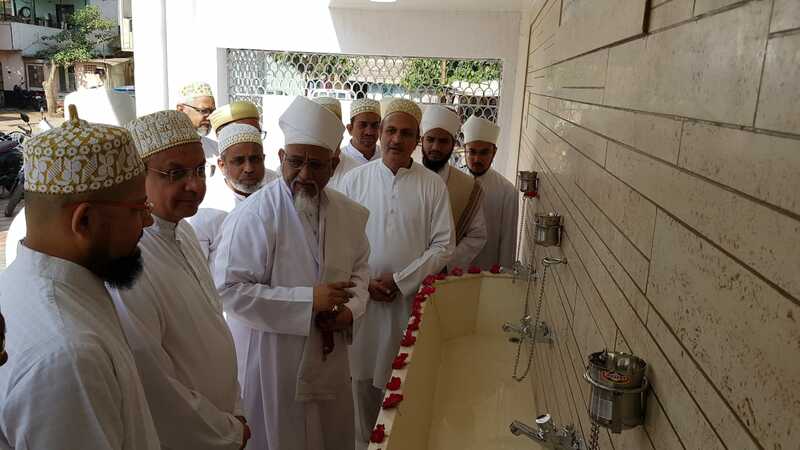 In Qabarastaan, Maulaa inaugurated the pure drinking water outlet at its entrance funded by the family of Safiyuddin bhai Dholkawala. 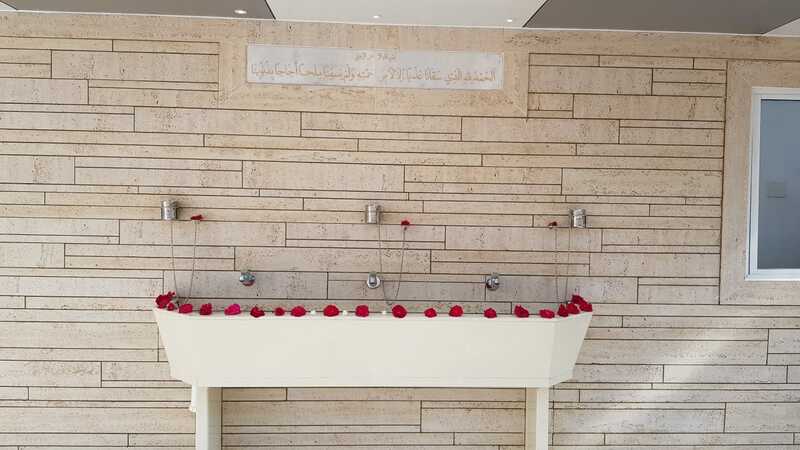 The beautifully designed water-outlet is a unique khidmat and the best Fayz fi-Sabeelillaah as it will serve the most sought after thing-water to mumineen visiting Qabarastaan for the Maghferat and Du’aa of their Marhumeen. Water is like Knowledge and it gives life to everything. The best water on this earth is of Bi’r-e-Zamzam whose water flowed under the feet of Maulaana Isma’il (as). We will get Aab-e-Kawsar from the dast-e-paak of Panjatan-e-Paak (as). Pure water is of Jannat and the filthy one is of Jahannam. Water supply to Sahebaan-e-Haqq was stopped by their enemies in most of the battles, but the same enemies were never deprived of water by the army of Sahebaan-e-Haqq, be it battle of Siffin or Karbalaa. We should drink water in three slots which are the stages of our Knowledge and that too with the praise and thanks of Allaah Ta’aala. Maulaana Ibraahim (as) saw Death as a beautiful person and mumineen would love to see him on death-bed. The more one tries to run away from Death the more it will become dreadful and fearful. Under the greatness and beauty of this Nooraani Masjid is buried the unimaginable sacrifice of Saheb-e-Da’wat. In the coming month of Sha’baan, Ra’s ul Hudood will go for the Ziyaaraat of Karbalaa-Najaf-Misr. Next year insha-allaah Mukaasir saheb will plan the tour for ‘Umrah Mufradah after the Arba’een of Imaam Husain (as). Today I would like to tell from this very book, the ‘Ejaaz of the Handkerchief of Rasoolullaah (saws). Uns bin Maalik says that, “One day Rasoolullaah left his handkerchief and I took it with me thinking that I will hand over to him as soon as he meets me. I took it in my house where I started making food in tandoor. Accidently that handkerchief slipped into the tandoor and I thought it might have got burnt in the fire. But when I tried to take it out, I saw nothing has happened to it. It was intact without any spots. I took it and kissed it.” This was only because Rasoolullaah (saws) used to wipe and rub it on his mubaarak face while doing Wuzu or sweating. 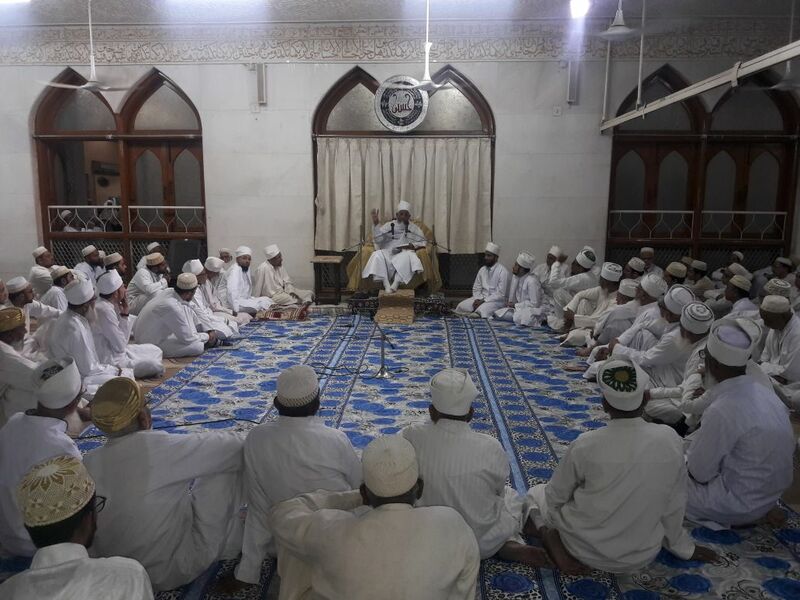 Huzoor-e-'Aali (tus) presided over the Majlis of 41st Shab-e-'Urs of Saiyedna Nooruddin Yoosuf bin Saiyedna Badruddin Saheb (aq) in Masjid un-Noorani. Huzoor-e-'Aali (tus) completed 41 years being the 44th Da'i al-'Alavi al-Faatemi. In his Bayaan he remembered how Muqaddas Maulaa played a pivotal role in the construction of Masjid un-Noorani. 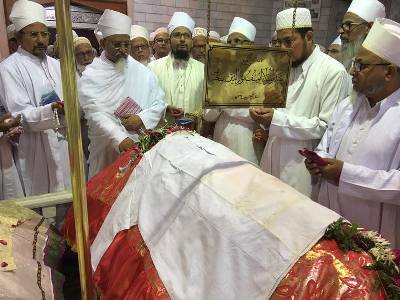 He also declared the celebration of two auspicious events in the month of Sha'baan un-Kareem - one is the Iftetaah of newly constructed Qubbah Mubaarakah of Saiyedna Badruddin Saheb (aq) on 8th Sha'baan and second is the Iftetaah of the Badri Masjid in Mumbai on 10th Sha'baan 1435 AH. 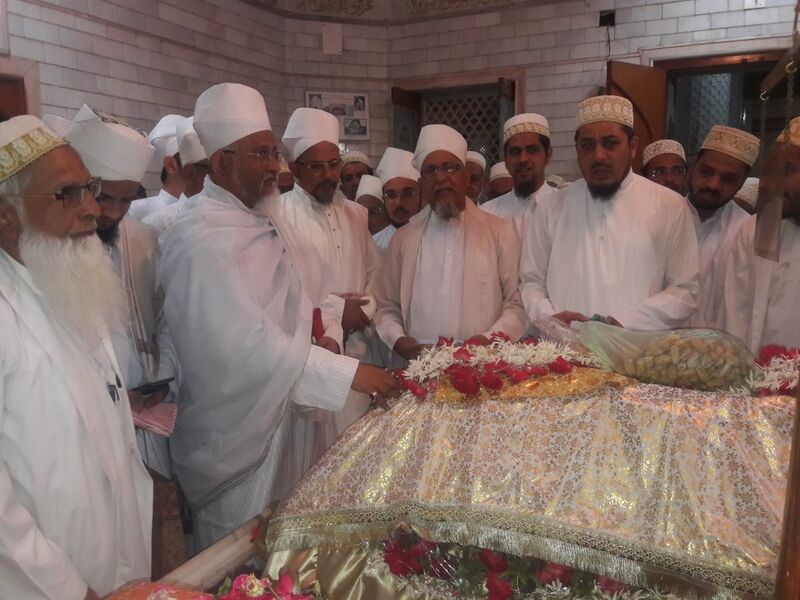 Urs-e-Maymoon of Muqaddas Maulaa happened to be a memorable event when his “mansoos ‘alayhe” 44th Da’i ullaahil Ameen, Haadi ul-Mumineen Saiyedna wa Maulaana Abu Haatim Taiyeb Ziyauddin saheb (tus) visited Mazaar-e-Yusufi with Hudood and mumineen and a bayt-e-khaass “Misl-e-Qamar hai Taaron mai, Maulaa tera Mazaar” composed by his ma’zoon-o-mansoos Saiyedi Haatim Zakiyuddin saheb (dm) was recited in chorus and it seemed that Malaa’ikah has descended from the spiritual world to shower the rahmat and barakaat from Baargaah-e-Rabbaani on the gathering of Mumineen. 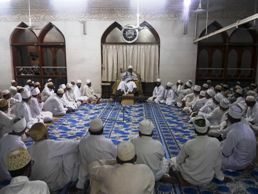 Huzoor-e-‘Aali Saiyedna saheb (tus) headed the majlis of layt ul-‘Urs in Nooraani Masjid. After Qaseedah-khwaani Maulaa delivered Bayaan reflecting the haalaat of the last days of his father Muqaddas Maulaa. He recounted the events when Muqaddas Maulaa was brought back to Vadodara after the short treatment in Mumbai during Ayyaam ul-Beez. He vividly described the time of Salaat uz-Zawaal on 15th Rajab 1394 AH, when Muqaddas Maulaa gave razaa for Imaamat and at the end of namaaz when he went to Devdi Mubaarak with all the Hudood and Muqaddas Maulaa did Nass on him in front of large gathering by keeping his ‘amaamah (paghdi) on his head and declaring him as his successor. 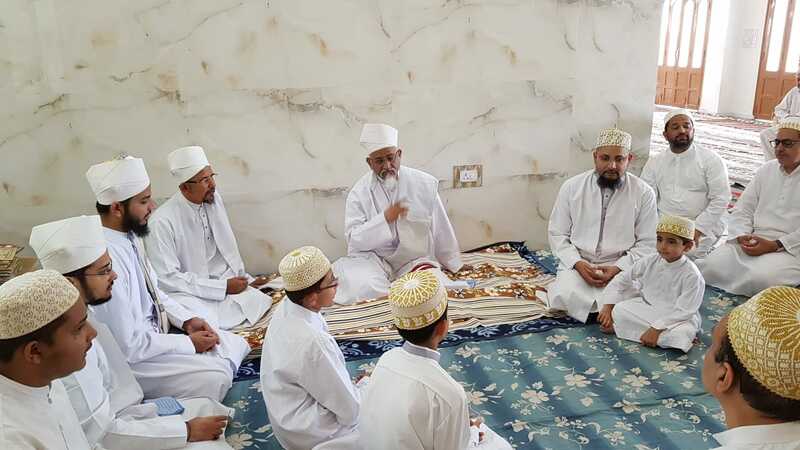 Mazoon ud-Da’wat Saiyedi Haatim Zakiyuddin saheb (dm) headed the majlis of Shab-e-‘Urs where in his impressive Bayaan he stressed on the role of Du’aat-e-Mutlaqeen (aq) in building strong faith in the highest ranks of this spiritual Da’wat where Nabi holds the responsibility of the external (exoteric) aamaal of Shari’at and Wasi holds the reins to explain these aamaal in its inner (esoteric) sense. All of them are Nooraani and after them their Imaam and Da'i are also Nooraani. It is with this noor that they guide mumineen and have shafaa’at in their hands. He stated that, Mumineen should regularly come to the rawzah mubaarakah for the Ziyaarat and experience this noor with their eyes of Yaqeen and Etiqaad. Copyright © 2018 Alavibohra.org. All rights reserved.